STRATACACHE, Dayton, Ohio-based provider of scalable, high-performance digital signage, content distribution and company enterprise video acceleration technologies, is exhibiting at GlobalShop, an annual event dedicated to retail design and shopper marketing, April 16-18, 2013 at Chicago’s McCormick Place. GlobalShop attendees can experience STRATACACHE’s latest in-store digital media solutions including Digital Play,Retail Proxy and PrimaSee featured in booth no.1637. 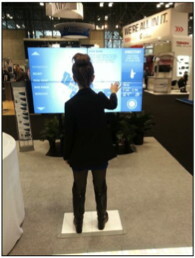 Targeting consumers of all ages, STRATACACHE’s Digital Play solution displays high-definition, interactive product and brand messages programmed to respond when a consumer interacts with sales and marketing content via motion-based gestures. STRATACACHE is a privately-held company working with over 300 of the world’s largest firms in the retail, finance, service, hospitality, manufacturing, media and government sectors. This entry was posted on Tuesday, April 16th, 2013 at 16:00 @708 and is filed under Scuttlebut. You can follow any responses to this entry through the RSS 2.0 feed. You can leave a response, or trackback from your own site.